• Open area design for easy access. • Throat dimensions: 10" H x 13" D.
• Dimensions L 24" x W 12" x H 24"
• 7200 SFPM belt speed. • 5" lower contact wheel. 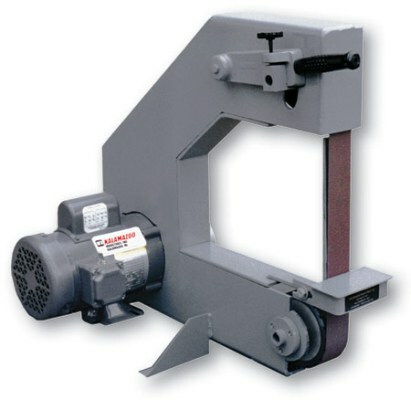 MODEL BG272 2" x 72" belt grinder. Bench model, 1 HP TEFC, 1 PH 110/220 volt motor. Manual switch. Wt. 80 lbs. Same as above but with heavy-duty stand legs. Wt. 150 lbs.